Even though it’s not as popular as the Northern or Coastal Way, it’s one of the oldest. We are talking about the Tunnel Route, also known as Way to Bayona (Camino de Bayona) and used by the Romans. It became one of the most important paths connecting the Castilian plateau and France during the Middle ages. The Tunnel Route was inaugurated in the 13th century by the king Alfonso VIII of Castile as Royal Road (Camino Real). Thus the path attracted many peregrins thanks to its improvents and the security against bandits. As years were passing, the Tunnel Route became less popular as people preferred it over the French Way. Thus it was slowly abandoned. However the Association of Friends of the Way to Santiago achieved to recover the route’s fame and nowadays many peregrines choose this path to walk to Santiago. The rich green landscapes, nature, good food and the local people’s care are what make the Tunnel Route an ideal option. Irún is a beautiful village bordering France and the start point of the Tunnel Route. 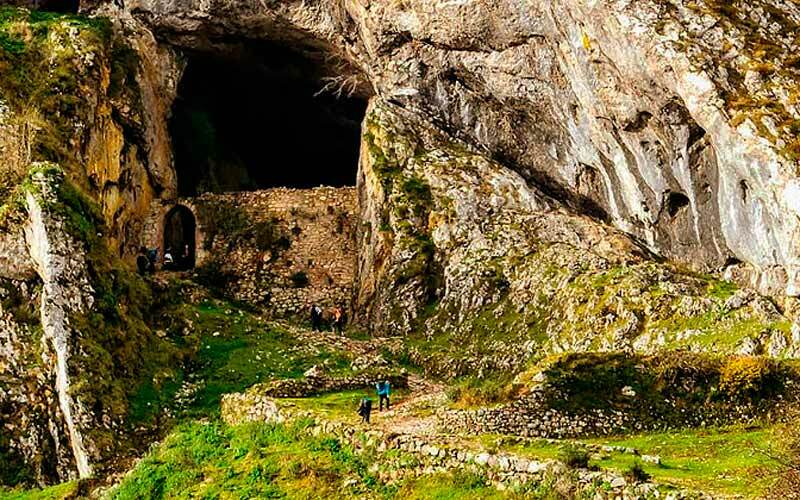 You will visit stunning places like Oiartzun or the Hermitage of Santiagomendi which is actually one of the tallest points of this stage, over 296m. The stage follows the Bidasoa River. The charming scenery will leave you breathless. Green fields, flocks of sheep, hundreds of apple trees, oak and pine forests set an ideal surrounding to enjoy your rute. The second stage of the Tunnel Route begins in Hernani. It is totally worth dedicating some time to visit it as it one of the oldest villages of Guipuzkoa. It finishes in Tolosa, in the valley of the Oria River, where you can visit the Atodo palace which is of renaissance architecture. Some places you will see on this stage are Urnieta, Villabona and Anoeta. However, the route passes close to the highway and railway so the idyllic landscape will soon disappear. So don’t miss the chance for some active tourism or trying the famous local cider. In this stage the piligrims return to the pleasant green landscape, the best example is crossing Mount Ollaun. Moreover, if you choose the Tunnel Route, you will be lucky enough to go until Igartza, a monumental ensemble and reference of the Basque architecture, with 16th century buildings. You will also walk to Olaberria, the highest point, where the rural landscape will leave you breathless, even though you will be just as amazed when you reach Idiazábal, a village named after the famous and delicious cheese. The peaceful Zegama is an off the beaten edge place, and it is considered a base for people heading to the Aizkorri Natural Park. During centuries, the park thrived as a resting place of the Royal Road until it slowly changed of use in order to become a carriage road. Climbing up the slope we see the Iruetxeta and Sancti Spiritus hermitage, until reaching the San Adrian Tunnel. It’s a natural passage in the Aizkorri mountain range, 1.200 meters high and by far the most fascinating and legendary place of this route, as it even had its own mayor. The Tunnel Route continues to Gazeo, Salvatierra. There you can visit a beautiful 13th century church, that of San Martín de Tours. It’s actually a Roman church which has been changed several times. Nonetheless, it is considered as one of the most important monumental ensembles of the Basque Country, with a number of Gothic wall paintings. We recommend previously contacting the Tourism Office of Salvatierra for a visit. The path leads you to Ezkerekotxa where you should visit the Roman church of San Román. You can continue to the hermitage of San Juan de Salvatierra, one of the most ancient of Roman Álava style. If you have to spend the night there, you should definitely stay in Vitoria-Gasteiz; its two cathedrals and a picturesque historic centre are well worth a visit. On the outskirts of the town, we find the basilica of San Prudencio, a special treasure you to appreciate while walking the Tunnel Route. It’s a monumental historic-artistic Roman ensemble built in 12th century. The most special about this stage is its “Castilian part”. It begins in Burgos, in Condado de Treviño. In addition, the path ends in Puebla de Arganzón, a magnificent city founded in 12th century and is now considered a monument of Cultural Interest. Its Roman Bridge and walls will fascinate you. During this stage, you will walk in a beautiful background; the Sierra de la Demanda and you will pass by unique places like Zarratón o Madrid de los Trillos. The most important about the last kilometres of the Tunnel Route is its connection with the French Way in a charming village called Santo Domingo de la Calzada. From that point and on you have to follow the corresponding arrows.